Bryce Harper and the Philaelphia Phillies agreed Thursday to a $330 million US, 13-year contract, the largest deal in baseball history. ​It took a long time and a lot of money, but the Philadelphia Phillies finally landed Bryce Harper with a record contract. The young star outfielder and the Phillies agreed Thursday to a $330 million US, 13-year contract, the largest deal in baseball history. Harper's agent, Scott Boras, said the deal was agreed to shortly before noon, subject to a successful physical. Phillies manager Gabe Kapler and his players learned of the agreement from fans behind Philadelphia's dugout who saw media reports on their mobile devices during a spring training game in Clearwater, Florida. "Harp's goal was he wanted the largest contract and he wanted his value," Boras said. "He wanted the largest length he could get because he really wanted to stay in one city and one uniform, wanted to get a ballpark he hit well in, saw the ball well." The Nationals made an offer toward the end of last season — a $300 million, 10-year contract that included $100 million in deferred money that Harper would have not entirely received until he was 60. The offer no longer was on the table after free agency opened without an agreement. "We get a whole lot better on the field," the manager said. "Bryce Harper is a sensational teammate." Harper's agreement tops the previous high for a free agent, set last week when infielder Manny Machado signed a $300 million, 10-year deal with the San Diego Padres. 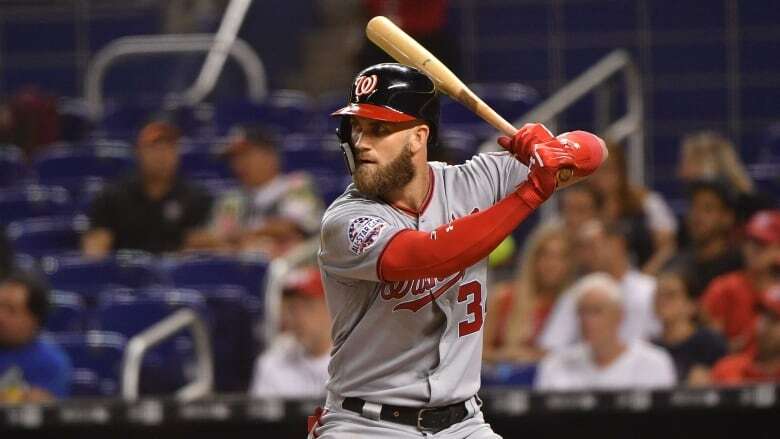 Harper's average annual value of $25.4 million ranks 14th in baseball history, well below the high of $34.1 million set by Arizona pitcher Zack Greinke as part of a $206.5 million, six-year contract that started in 2016. Harper gets a $20 million signing bonus payable this spring, a $10 million salary this year, $26 million in each of the following nine seasons and $22 million in each of the last three years. None of the money is deferred, and he gets a full no-trade provision. Philadelphia will forfeit its second-highest draft selection, currently No. 55, and $500,000 of its 2019-20 international signing bonus pool allotment. Because Washington paid luxury tax last season, its compensation pick will be after the fourth round, about 140th. Last year, he hit 34 homers and produced a career-high 100 RBIs while walking 130 times, although his batting average dipped to .249. He started more than a third of his games in centre field instead of his usual spot in right because of injuries to teammates. Phillies owner John Middleton met with Harper in a Las Vegas hotel suite and at dinner around the time of the winter meetings in December and then again last weekend. Boras said Middleton's wife, Leigh, and Harper's wife, Kayla, were part of the gathering. "Bryce just really enjoyed John's passion for winning and the commitment he could make to the franchise," Boras said. Philadelphia has been among the most active teams this off-season, adding outfielder Andrew McCutchen for $50 million over three years and reliever David Robertson for $23 million over two years, and acquiring catcher J.T. Realmuto and shortstop Jean Segura. The Phillies also gave ace Aaron Nola a $45 million, four-year deal. San Francisco and the Los Angeles Dodgers had also pursued Harper in recent weeks. Boras said shorter-term offers had average annual values as high as $42.5 million. Boras was the agent for a record contract for the fourth time after pitcher Kevin Brown's $105 million, seven-year deal with the Los Angeles Dodgers ahead of the 1999 season, Alex Rodriguez's $252 million, 10-year agreement with Texas before the 2001 season and Rodriguez's $275 million, 10-year contract with the New York Yankees before the 2008 season.